Recently I had to generate some test cases reports from Jazz Quality Management with RPE 1.1.2. Everything went very smoothly until I also needed the testing results to be contained in my reports. 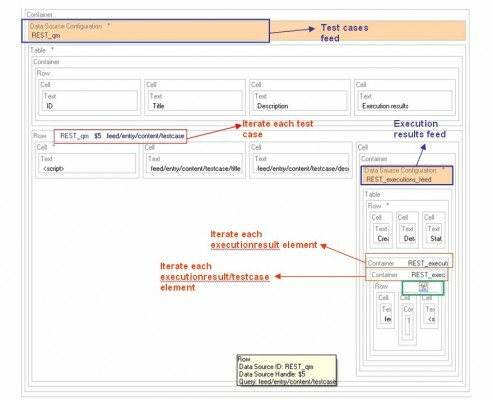 As you know, in RQM you have the possibility to assign an execution result to each test case. In this way, you can see which test cases passed and which of them failed. Also, a test case can have several results. 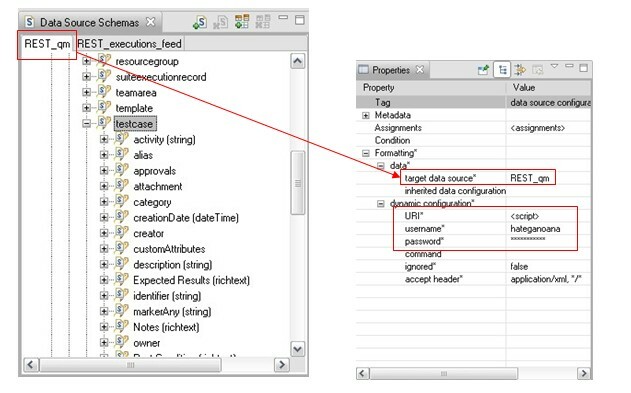 Each execution result element from the data source schema has a feed/entry/content/executionresult/testcase element. This element tells us to which test case this result belongs. If we compare the attributes feed/entry/content/testcase/identified and feed/entry/content/executionresult/testcase/href, we can deduce whether the execution result belongs to the current test case or not. We will use a condition to display only those execution results belonging to the test case. 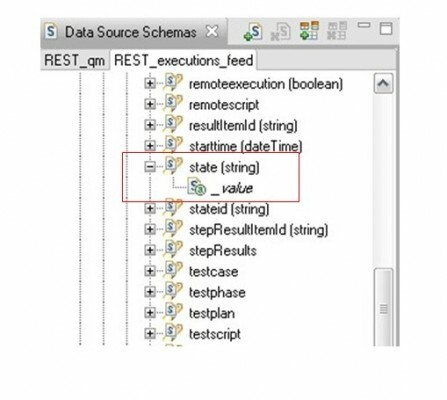 In order to iterate all the test cases, you must first add the QM data source schema and then add a Data Source Configuration Element to your template. The target data source will be REST_qm. The dynamic configuration URI will be: https://giediprime:9445/qm/service/com.ibm.rqm.integration.service.IIntegrationService/resources/Web Publisher (Quality Management) /testcase?fields=feed/entry/content/testcase/*. You also need to introduce your Jazz username and password in the Properties panel. For each execution result we need to iterate through all feed/entry/content/executionresult elements. In order to do this, add a new data source to the template. Use the same URL for feed schema and name the data source REST_executions_feed. You need to insert one more Data Source Configuration element that will have as target the REST_execution_feed data source. After that, set the URI of the configuration element. The last column of the test cases table iterates all the execution results. In this column there is inserted another table, which has one entry for each execution result associated to the test case. For each execution result, it must be verified if the execution result element corresponds to the current test case. If the condition is verified, the execution result is displayed. The execution result state is contained by the feed/entry/content/executionresult/state attribute. Thanks for this detailed article, I appreciate it. It gave me a starting point to report ExecutionResults. But I am facing a problem, even after following all these steps religiously I am still not able to get the ExecutionResults for each test case in the report. All I get is a table with TestCase names but the last column is always empty. Am I missing something or is there some known issue. I can only think of two things that could go wrong: either the dynamic data source element for executions is not configured correctly or the execution records are not correctly associated to a test case in Rational Quality Manager. In order to check this, could you please send me the dynamic configuration URI of the executions data source? You could also check if the View Test Case Execution Records from the Execution menu in RQM. Thanks for the quick response, I was eventually able to resolve the issue. The problem was with the paging of RQM Feeds, I was getting only 10 Test Cases and Test Results from RQM and they didn’t always corresponded to the 10 Test Cases I had. To solve this I had to specify the Recursion Level which got me all the Test Cases and Test Results in RQM. With RQM 4.0 or later I think there is a more performant solution than iterate over all execution results. 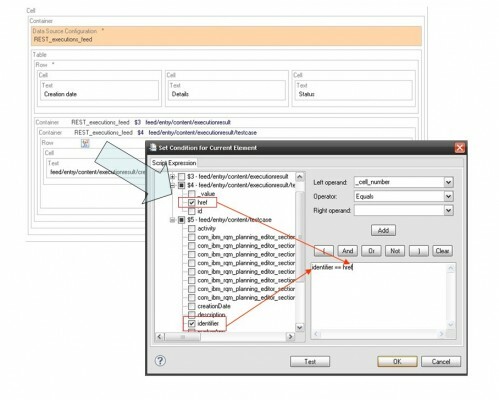 It uses fields parameter to filter resources returned by RQM. Can you please give the script used for state of exection result? I am facing the issue ll I get is a table with TestCase names but the last column is always empty.